Essex, CT (January 24, 2019) The Connecticut Spring Boat Show will be held Friday, May 3 – Sunday, May 5 at Essex Island Marina, a Safe Harbor Marina, 11 Ferry Street, Essex, CT. The show is a production of WindCheck Magazine and is sponsored by Essex Island Marina, Yacht Brokers Association of America, Essex Boat Works, Essex Steam Train and Riverboat and YachtWorld. 100% of attendee gate proceeds will go to Sails Up 4 Cancer, last year over $10,000 was raised for the organization. “Boaters from all over New England down to New York get excited to visit the Connecticut Spring Boat Show to experience the wide selection of power and sail boats. The venue makes it easy to hop aboard and spend time chatting with knowledgeable brokers in a relaxed and fun environment.” said Tom Pilkington, owner of Prestige Yacht Sales. “Due to changes in CT Tax law, which lower the state tax on boat purchases from 6.35% to 2.99% in 2019, we anticipate a growing interest in this boutique show.” said Pilkington. “Safe Harbor Marinas is proud to sponsor this event annually” said Doug Domenie, Northeast Central Regional Vice President. “It is truly unique because of our beautiful, family friendly venue in the historic waterfront village of Essex, CT. No other show, boutique or otherwise, has a setting like ours and the SHM team really take pride in hosting it.” Essex Island Marina is located on a 13-acre private island on the Connecticut River, accessed by a complementary ferry service, and offers 125 slips accommodating vessels up to 200’. Over thirty land based nautical exhibitors are expected to grace the dockside lawns on the Island along with the seventy plus expected in water boats. Over 2500 visitors are anticipated with a suggested donation of $5 per person to benefit Sails Up 4 Cancer, a non-profit organization and local charity who distributes funds raised to families impacted by cancer. Attendees will see a wide range of new and brokerage, power and sail models with sea trials available. Boating gear, accessories, waterfront real estate and “water lifestyle” service companies will also be on site. Sails Up 4 Cancer is a non-profit organization based in Mystic, Connecticut. SU4C has been dedicated to supporting cancer care, education, prevention and research along the Shoreline and Southeastern regions of Connecticut. To learn more, go to SU4C.org. CT SPRING BOAT SHOW: The CT Spring Boat Show, May 3-5, 2019 features some of the newest boats on the market including center consoles, fishing boats, luxury cruisers, sport and sail boats. The show is open to the public at Essex Island Marina, a Safe Harbor Marina with a requested $5 dollar donation to Sails Up 4 Cancer for attendees ages 13 and up. Free parking is provided. Visit www.ctspringboatshow.com for specific event details or Ben Cesare of WindCheck Magazine at​ contactus@windcheckmagazine.com for dealer and vendor application information. Sails Up 4 Cancer is proud to announce that it has been selected by Subaru America as part of this years Share the Love campaign in conjunction with Holmgren Subaru in Franklin, CT. Subaru has donated over $50 million towards a variety of charities across the country. From November 15, 2018 until Jan 2, 2019 Subaru will donate $250 to Sails Up 4 Cancer for each car sold. Sails Up 4 Cancer, founded in 2011 is a 501(c)3 non profit corporation based in Mystic. Over the past four years Sails Up has donated over $150,000 to a variety of research centers, hospitals, hospice care, and individuals dealing with all types of cancer. Subaru of America, Inc. donated $10 million to charitable partners during its seventh annual “Share the Love” event. Since the inception of the program, Subaru has donated over $50 million. Sails Up 4 Cancer (SU4C) is incredibly proud to have been chosen as one of this year’s charities for their campaign. Thanks to Holmgren Subaru, in Franklin , CT, Subaru was able to donate $250 for every new vehicle sold earlier this year; resulting in an incredibly generous gift to SU4C. “Don’t lose sight of the fact that the Holmgren team educated their customers about Sails Up, customers have a variety of options as far as where the donations go… Wounded Warrior Project, ASPCA and many other national charities but Holmgren believes in Sails Up and wanted to see the gift stay local,” explained Ken Scanzio, Subaru District Sales Manager. Bob Davis, CEO of SU4C has partnered with the Holmgren team for numerous years on a variety of projects. “Bob has become a personal friend and he is passionate about Sails Up, it is impossible not to get involved and be supportive when the leader is someone who has not only survived cancer but works incredibly hard to raise funds for future research. I am proud to be a part of such a great organization,” said Eric Holmgren. 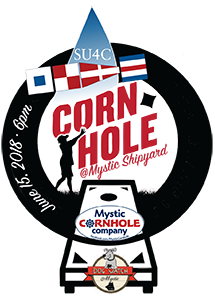 SU4C is a non profit organization dedicated to funding research in the education, prevention and cure for all types of cancer through the art and enjoyment of sailing. To fulfill these goals, SU4C partners with local yacht clubs, sailing clubs and other like-minded organizations to host regattas. The aim is to have these regattas appeal to everyone and not just the racing enthusiast. 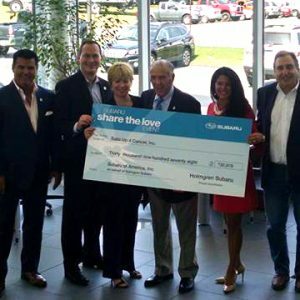 Holmgren Subaru is proud to donate over $30,000 to SailsUp 4 Cancer through the Share The Love Campaign. The money, raised by Holmgren, will go toward funding education, prevention, care and cure for all types of cancer. For nine years, Subaru and its retailers have partnered with more than 660 non-profits to show the company’s commitment to helping local communities. By the end 2017, Subaru hopes to exceed a grand total of $90 million donated since the creation of Share the Love. Sails Up 4 Cancer, one of Southeastern Connecticut’s leading providers of financial assistance to cancer patients, is ecstatic to be the recipient of $30,000 from The Subaru America Share the Love 2017 campaign via Holmgren Subaru of North Franklin, CT.
“The Holmgren team and family have long been supporters of Sails Up4 Cancer. We appreciate the organization for its unique niche in bringing much needed financial support directly to cancer patients and not through a third party,” said Eric Holmgren, president of Holmgren Subaru. Eric Holmgren is an avid sailor and dear friend to Bob Davis, President and founder of SU4C. Davis is a two-time cancer survivor and has an intimate relationship with cancer and cancer patients. Eric, and his wife Dawn, along with the Holmgren Family and the staff at Holmgren Subaru, believes that because of Davis’ experience with two cancers and his personal empathy with the agony that patients endure, he is the perfect person to address their needs. Having lived through the stress of cancer and loss of income, Davis is in a formidable position to support those suffering with the hidden effects and stress that comes with a cancer diagnosis. “We cannot just provide lip service to those in need of financial assistance. We must heed the call and respond effectively and efficiently in sending financial relief,” explained Davis. The Connecticut Spring Boat Show welcomed over 60 boats, varying in size from 10-55 feet, to the third annual show.The show was a production of Windcheck Magazine and was sponsored by Brewer Essex Island Marina / Safe Harbor, Essex Boat Works, and the Yacht Brokers Association of America (YBAA). Sails Up 4 Cancer, a Connecticut-based non-profit organization, was this year’s beneficiary. Working with the producers of the show, a $5 suggested donation was collected at the entrance of this year’s show. CT Spring Boat Show is in full support of SU4C, who are dedicated to supporting cancer care, education, prevention and research. New this year was the addition of a special cocktail cruise aboard the Becky Thatcher, from Essex Steam Train and River Boat. Visitors could set sail on Friday evening for a beautiful CT River cruise with proceeds also going to SU4C. 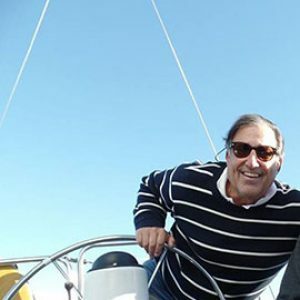 With the suggested $5.00 donation, Sails Up 4 Cancer will continue their mission of supporting cancer care, education, prevention and research along the Shoreline and Southeastern regions of Connecticut. With the creation of the financial, family-assistance program, the Spinnaker Fund, SU4C has been able to alleviate financial stress and give much-needed financial relief to many families. Additionally, SU4C gives significant donations to local Cancer Hospitals, Center for Hospice Care, and Visiting Nurses among others. June 16, 5pm: Post Regatta Party with Rock N Soul Revue and Dark N Stormy Stations! Essex Steam Train & Riverboat teams up with Connecticut Spring Boat Show to help raise funds for SU4C! Sails Up 4 Cancer is pleased to partner with the Connecticut Spring Boat Show. This boutique, in-water show is May 4 – 6 at Brewer Essex Island Marina. 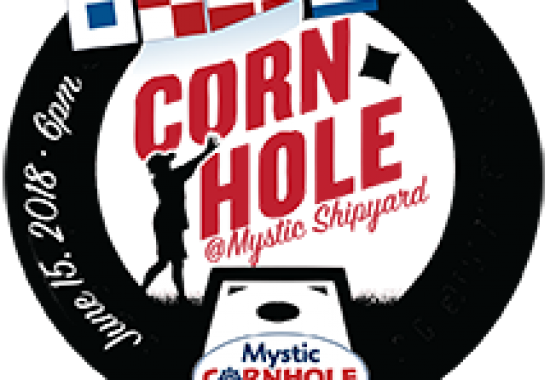 Produced by Windcheck Magazine and supported by Brewer Essex Island Marina, Essex Boat Works, Yacht Brokers Association of America, and Yacht World, this show offers boats for every buyer. A suggested $5.00 donation (from attendees over 13 years old) will go to Sails Up 4 Cancer. Sails Up 4 Cancer is a non-profit organization based in Mystic, Connecticut. SU4C is dedicated to supporting cancer care, education, prevention and research along the Shoreline and Southeastern regions of Connecticut. Additionally, on Friday, May 4, Essex Steam Train & Riverboat is hosting a sunset cocktail cruise aboard the Riverboat Becky Thatcher to benefit SU4C. Passed hors-d’oeuvres will be served and a cash bar is available 6:00 pm – 7:30 pm. Tickets are $5 and will be on sale aboard Becky Thatcher at 5:00 pm. Boarding time is 6:00 pm, setting sail at 6:30 pm. Tickets are first to come, first served and capacity is limited to 125 guests. ESTR will match all ticket sales up to 125 tickets to benefit SU4C. Proceeds from all bar sales during the cruise will be gifted to Sails Up 4 Cancer. Hot coffee, cold juices, and morning bites will be available aboard Becky Thatcher from 8:00 am – Noon on Saturday and Sunday, May 5 & 6. FRANKLIN – Since its founding six years ago, Sails Up 4 Cancer has donated thousands of dollars to organizations, including the Children’s Cancer Research Fund and the Visiting Nurses Association of Southeast Connecticut. It also has helped dozens of New London County cancer patients pay their bills and put food on the table. On Tuesday morning, Bob Davis, a two-time cancer survivor, avid sailor and the founder and CEO of the nonprofit Sails Up 4 Cancer, accepted the charity’s largest donation yet. The Holmgren family, of Holmgren Subaru in Franklin, presented Davis with a check for nearly $31,000. 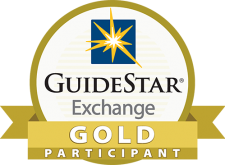 The donation was the result of Subaru of America’s “Share the Love” campaign, in which a portion of each sale or lease of a Subaru during a specific time frame is donated to a retailer’s charity of choice. Eric Holmgren, of Holmgren Subaru, said selecting Sails Up 4 Cancer as the campaign’s beneficiary for the last four years has been an easy choice. “I liked how the money stayed local,” he said of the charity. 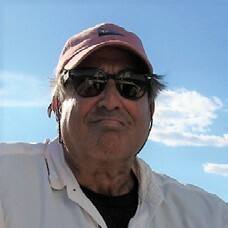 Also a boating enthusiast, Holmgren first met Davis through sailing more than a decade ago. The two became good friends. “He’s just one of those people you meet who are incredibly positive and nothing gets them down,” Holmgren, of Mystic, said of Davis. Along with awarding grants to large organizations such as Lawrence + Memorial Cancer Center and the Center for Hospice Care Southeast Connecticut, Sails Up 4 Cancer also supports, through its Spinnaker Fund, individuals in the midst of cancer treatments who need help paying their rent, utility bill or simply buying groceries. “They just do all the little, tiny things that make someone’s life better,” Holmgren said. The seeds of Sails Up 4 Cancer were planted in 2004, when Davis was diagnosed with chronic lymphocytic leukemia. Shortly after, the Niantic resident began raising money for the Leukemia & Lymphoma Society through its Leukemia Cup Regatta. Over four years, Davis raised more than $50,000 for the national organization, he said. Then, in 2011, he was diagnosed with esophageal cancer. Davis said he was moved to “do more” to help those affected by cancer, and to put his efforts toward making a local impact. Davis, who spent his career in construction management, said he has been fortunate through the years to be able to afford his medical treatment and to own his boat. Be he knows that’s not the reality for many who are diagnosed with cancer, particularly single heads of households. “I can’t imagine what they go through,” he said. Sails Up 4 Cancer has been the first to donate $5,000 to the Single Women’s Head of Household Cancer Assistance Fund through the L + M Cancer Center’s social services division. For more information on Sails Up 4 Cancer, visit su4c.org.